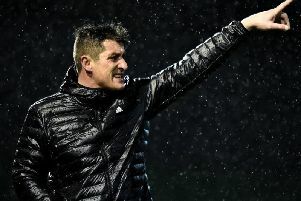 STEPHEN Kenny’s first half strike ended Derry City’s EA Sports Cup journey as First Division outfit Limerick deservedly progressed to this season’s showpiece. It could have been more for the Shannonsiders as Gerard Doherty produced two sensational saves to deny both Aaron Greene and Chris Mulhall while Freddy Hall twice denied Josh Daniels as City chased the game late on. Martin Russell’s troops who are storming their way to the First Division title now have the chance to win the League Cup for the first time since the 2001/02 season. Derry boss, Kenny Shiels had made just two changes from the team which drew 0-0 with Sligo Rovers 72 hours earlier with Aaron Barry and Josh Daniels replacing Ronan Curtis and the injured Patrick McClean. Limerick started strongly and came so close to shocking their hosts after 60 seconds when Aaron Greene did well to play Mulhall in behind the Derry defence but Doherty smothered his low shot before the ball was eventually cleared behind for a corner. The visitors gave away possession deep in their own half on seven minutes and Schubert found Patterson whose first time strike went straight into the hands of Freddy Hall. Five minutes later Niclas Vemmelund’s cross broke to Patterson but he blasted his volley from 12 yards high over the crossbar. Limerick then took the lead when Shane Tracy’s curling cross from the left wasn’t dealt with by Dean Jarvis and Kenny picked up the pieces, slotting underneath the body of Doherty from eight yards on 15 minutes. It was no more than they deserved after an impressive start and the danger signs were there early on for the home lot. Content to hit Derry on the break, the Shannonsiders almost doubled their lead four minutes later when Mulhall sent Aaron Greene into space on the edge of the box and his shot skimmed narrowly wide of Doherty’s post. Derry winger, Daniels laid the ball into the path of McNamee on the periphery of the Limerick box and the Ramelton man’s strike deflected just wide. The Candystripes best chance of the half arrived just after the half hour mark when McNamee’s inswinging cross was headed over the bar at the far post by Schubert who really should have done better. Vemmelund tried his luck from distance with a powerful drive and when Hall spilled the shot, Paudie O’Connor was on hand to clear the danger with five minutes to go before the break. McCormack fizzed a 25 yard shot over the bar on the stroke of half-time as Derry continued to be frustrated by a well organised Limerick defence. It was a quickfire start to the second half by Derry but the home side needed their goalkeeper to produce an outstanding double save to deny Limerick. Doherty parried clear Greene’s blistering strike on 55 minutes and somehow managed to put Mulhall’s close range rebound over the bar with a strong hand. And Doherty again saved from Greene’s header two minutes later as the First Division outfit turned up the pressure. At the other end Limerick keeper, Hall saved at full stretch from Patterson’s shot on the turn. Hall again denied Derry’s leading goalscorer an equaliser on 68 minutes as he got down low to save well. Limerick defended desperately with 20 minutes to go as firstly Daniels’ shot was pushed away by Hall before McNamee’s follow-up shot from 12 yards was deflected behind by O’Connor. Daniels was thwarted twice by the Limerick keeper inside 30 seconds as Hall pushed away his shot from the edge of the box before gathering his close range header from McNamee’s cross moments later. In the end the home side just didn’t do enough as Limerick stunned their hosts to progress to the final. Derry City: G. Doherty; N. Vemmelund, R. McBride, A. Barry (C. McDermott 65), D. Jarvis; L. Schubert, C. McCormack, A. McEneff, J. Daniels; B. McNamee (Boyle 78); R. Patterson; Subs Not Used - S. Patton, J. Allen, K. Ward, R. Curtis, H. Monaghan. Limerick - F. Hall; S. Kelly, P. O’Connor, R. Williams, S. Tracy; S. Kenny, P. O’Conor, S. Duggan, S. Russell; A. Greene (R, Mann 90); C. Mulhall (J. O’Flynn 79) P; Subs Not Used - T. Holland, G. Coughlan, T. Whitehead, S. McSweeney, L. Lynch. Referee - Robert Harvey (Dublin).